Dragon*Con is only two months away, so all you costumers take a deep breath before we head into crunch time. Mike, Mike, Darren, and Nikki Rau-Baker are joined by the official Dragon*Con Director of Media Relations, Dan Carroll, who gives us the latest news about this year’s show. We also have a spot of tea with the assistant director of the British Media Track, Robert Bowen, and gather around the bardic circle to listen to the director of the Filk Track, Robbie Hilliard. Plus, the latest celebrity guest announcements and advice on getting autographs. Starting breaking in those new shoes! Androids, replicants, automatons, mechanical men…no matter what you call them, we do serve their kind on Earth Station One. Mike, Mike, award-winning author Bobby Nash, Dr. Scott Viguié, and the Amy Adams-obsessed Grundy discuss the greatest robots in fiction and whether or not they’ll be a reality in our lifetime. Plus, we travel back to 1860′s New York to strap writer Jim Musgrave in the Geek Seat! All this and the usual Rants, Raves, Khan Report, and Shout Outs! 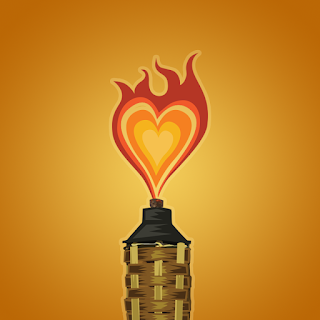 This week's Shout Out goes out to one of our sister podcasts on the ESO Network, the Ratchet RetroCast! I was honored to be invited to join Q, Strangeway, and Ratchet for their Man of Steel episode. It was great geeky fun! 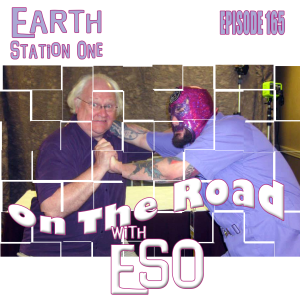 The Earth Station One returns next week to discuss the works and legacy of H.G. Wells! ESO wants to hear from you! What are some of your favorite H>G> Wells stories? Have you recently visited a cool convention or planning one? Drop us a line at www.esopodcast.com, the ESO Facebook Group, email us at esopodcast@gmail.com, or call us at 404-963-9057 with your comments. We just might air your comments on the show! While the 11th Doctor is away, the ESW crew is at play with past anniversary episodes starting with the first time the Doctor met himself and his other self. Mike, Mike, Jennifer, William, and Lucas Garrett battle bubble wrapped blobs, energy creatures, and the legendary Omega to witness history in the making as the First, the dandy, and the clown entertain. Goo goo g’joob! On this episode, the ESO crew goes up, up, and away to review the latest attempt to bring “The Big Red S” to the big movie screen. Mike, Mike and Jennifer are joined by Gary Mitchel (Revolution SF) and Andrew Leiter (Chameleon Chronicles) as they fire bulletpoints at the Man of Steel. We also find out Gary’s kryptonite as we strap him in The Geek Seat! 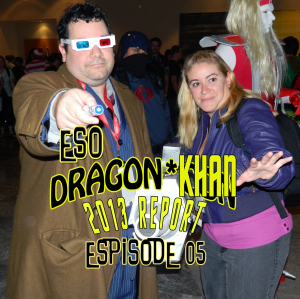 Plus all the usual Rants, Raves, Khan Report, and Shout Outs! This week's Shout Out goes out to an anthology of evil tales written by some good friends, including ESO's own award-winning author, Bobby Nash! 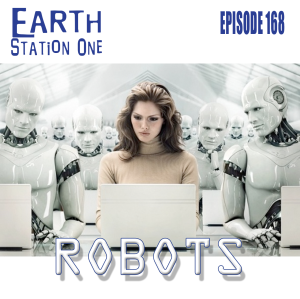 The Earth Station One returns next week to discuss automations, replicants, androids, mechanical men, and all things robotic. More human than human, that's our topic! ESO wants to hear from you! What are some of your favorite robots in fiction? 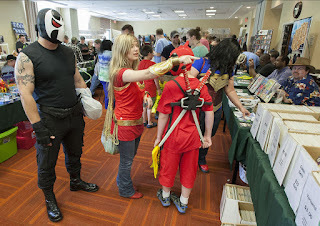 Have you recently visited a cool convention or planning one? Drop us a line at www.esopodcast.com, the ESO Facebook Group, email us at esopodcast@gmail.com, or call us at 404-963-9057 with your comments. We just might air your comments on the show! The ESW crew was preparing an intense look at the second half of series 7 when it was announced that the 11th Doctor will say good bye at the end of the year. Mike, Mike, Phantom Troublemaker, Jennifer Hartshorn, Lady Soliloque, and Drew Meyer express their thoughts on the unexpected changing of the guard along with the past season that was. 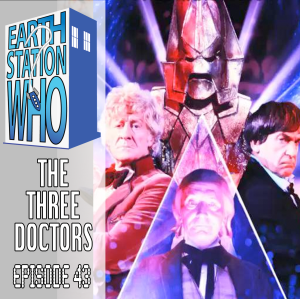 And we even find some time to revisit the Fifth Doctor and "Earthshock" (which was as impactful in its day as the departure of Matt Smith was to us this weekend). 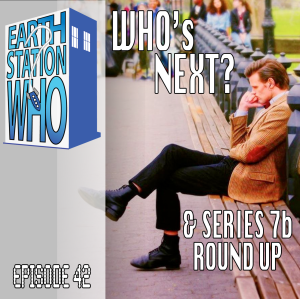 Earth Station Who Episode 42: Series 7b Review & Who's Next? This weekend is one of my favorite comic conventions of the year, HeroesCon in Charlotte, NC! Unfortunately, I will not be set up this year and only attending on Saturday, but I wouldn't dream of missing this show! If you are going and would like to meet up, feel free to contact me via this blog, Facebook, Twitter, or the social media of your choice. Hope to see ya there! After the show on Saturday, I'll stop by Fuel and fill 'er up then head back to Atlanta. Got a lotta work to get done for San Diego next month! Last weekend, I was a guest at the Marietta Comic and Anime Con, the first show og that kind in that area for quite some time. The con was very well attended and although Marietta is not that far from Atlanta, I saw so many different faces that it was like being in another state. Of course, saw some friends as well and I hope made some new ones. But don't just take my word for it! Two online articles have been published about the event and I'm in both (at least my picture anyway). Hey, I'm newsworthy!!! I want to thank everyone who came out on a rainy Sunday to see us! Thanks also to my fellow ESO crew (Mike and Bobby), and all the other guests and vendors who helped make the show a success. And a special thanks to Mario for organizing such a great show. There is another one scheduled for November 10th. Count me in! The ESO crew fights for survival against impossible odds (last time we let JD use the microwave and copier at the same time) and Mike, Mike, Jennifer, and the award-winning author Bobby Nash, reminisce with author Lisa Matthews Collins about some of greatest disaster stories of all time. Despite the station falling apart around us, we still take time to strap Chameleon Chronicles creator Drew Leiter in The Geek Seat and talk to Marc Ballard about the upcoming Knoxville Comic and Anime Show. Plus, the usual Rants, Raves, and Shout Outs! Don’t you worry, ESO will survive! Uh, can any listeners out there spare some duct tape? 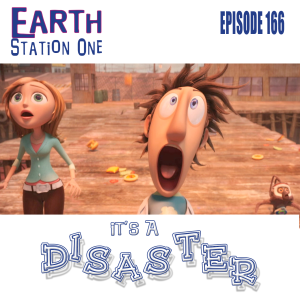 Earth Station One Episode 166: It's a Disaster! 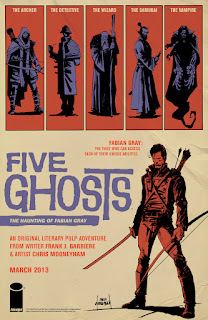 This week's Shout Out goes out to a comic currently at the top of my reading stack - Five Ghosts by Frank J. Barbiere and Chris Mooneyham. About the best thing I can say about it is that I really wish I'd thought of it! 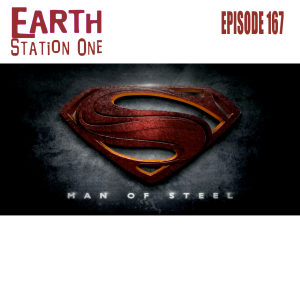 The Earth Station One returns in two weeks to review the latest big screen adventure of the Man of Steel! ESO wants to hear from you! What did you think of the new Superman movie? Have you recently visited a cool convention or planning one? Drop us a line at www.esopodcast.com, the ESO Facebook Group, email us at esopodcast@gmail.com, or call us at 404-963-9057 with your comments. We just might air your comments on the show! Only three months left until Dragon*Con! Remember costumers, the more sewing you do now, the less you’ll have to do last-minute and the more buckets of rum you can enjoy! While you’re working on your outfit, feel free to listen to Mike, Mike, Darren, and Mary chat with Doctor Q, the Alternative History Track director, Talloolah Love, the producer of the Pin Ups by the Pool and Glamor Geek Revue events, and Brian Richardson, co-founder of DCTV. Plus, we also offer a “Guide for the Socially Awkward” to help those not used to the con life. So listen up! Dragon*Con is only a June, a July, and an August away and there’s still so much work to be done! One of the many highlights of the Alabama Phoenix Festival was (finally) meeting writer Van Allen Plexico. It was an added bonus to be interviewed for his podcast! In addition to me, Van spends some time with several other notables in attendance--Bobby Nash, Sarah White, Sean Taylor, Doc Osborn, and David Wright-- discussing what they're up to and what they think about the Festival. A good time is had by all! So load up on Zaxby's and grab a seat in the Cahaba Center--good times await! 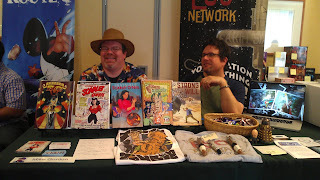 The Earth Station One crew attended two very cool conventions over the Memorial Day weekend. Mike Faber and Jennifer Hartshorn were guests at TimeGate along with fellow ESO Network personalities Dr. Scott (Doctor Geek's Laboratory), Jason and Rita (Transmissions from Atlantis), Debbie Vigue (The Thirteenth Hour), and Phantom Troublemaker (Earth Station Who/Needless Things). They found time to interview the amazing Moxie Magnus and there’s a rumor going around that they even met a Doctor! 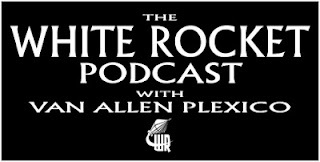 Meanwhile, Mike Gordon and the award-winning author Bobby Nash crossed state lines for the Alabama Phoenix Festival, where they met up with Joe Crowe (RevolutionSF podcast) and finally tied Van Allen Plexico (White Rocket Podcast) to The Geek Seat! Plus, the usual Rants, Raves, and Shout Outs! This week's Shout Out once again goes to two worthwhile Kickstarter campaigns that still need your help! 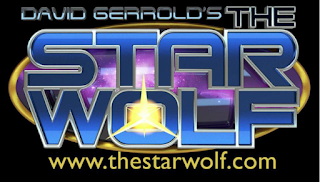 The first is for creating a series pilot for The Star Wolf, based on David Gerrold's novel series. I've read the books and I really want to see this show on tv, so please help make it so! 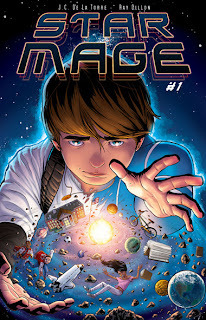 The second is for Star Mage, a new independent comic series by writer JC De La Torre and artist Ray Dillon. This series looks like something special, and I'd say that even if JC wasn't a fellow podcaster on The ESO Network! The Earth Station One crew fights for survival against impossible odds! From novels to movies, to TV, to theme park rides, we look at some of our favorite disaster stories. 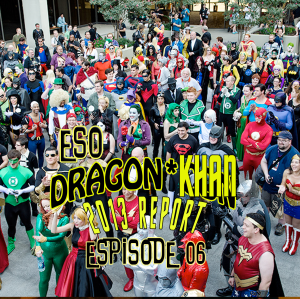 And it just wouldn’t be ESO without the ever-popular Rants and Raves, Shout Outs, and Khan Report. ESO wants to hear from you! What are your favorite disaster stories? Have you recently visited a cool convention or planning one? Drop us a line at www.esopodcast.com, the ESO Facebook Group, email us at esopodcast@gmail.com, or call us at 404-963-9057 with your comments. We just might air your comments on the show! 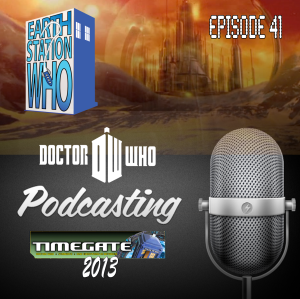 A special episode of the Earth Station Who podcast live from TimeGate 2013 featuring the Doctor Who Podcast Panel. A great time was had by all in the main ballroom. Recorded live on May 25th 2013 featuring Mike Faber from ESO/ESW, JC & Rita De La Torre from Transmissions from Atlantis, Ian Bisset from the Cultom Collective, Josh Wilson from the Oncoming Storm & Calliope from the Articles of the Shadow Proclamation Podcast. Thanks to the crew at TimeGate for hosting this panel, and a special thanks to the audience who endured our rants and raves about podcasting for an hour or so. *Note* Sound quality isn’t up to usal standards since this was a live recording. Enjoy!